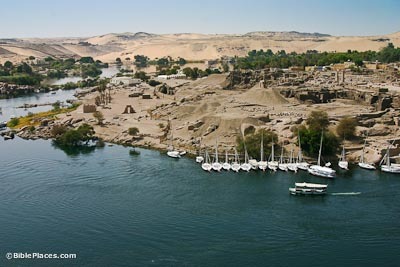 Aswan was the southern border of pharaonic Egypt. Here the desert reaches the banks of the river. The Nile River valley begins to the north of Aswan, as at this point the hard sandstone was difficult to cut through. At some points granite was exposed just beneath the surface of the sandstone. Granite is very hard rock and even a river like the Nile can only cut through it very slowly. Where granite is exposed, rapids, or cataracts, form. 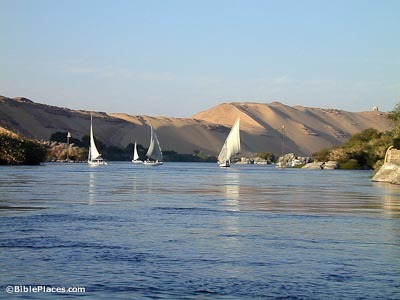 Along the Nile, there are 10 cataracts in total. The First Cataract, 7 miles in length, is just to the south of Aswan today, and it logically formed the southern border of Egypt. A person traveling along the river by boat would have to leave the river at this point and carry the boat across the desert, since it was not passable on the rapids. There were many Nilometers in Egypt, but the most important ones were at Elephantine Island. The Nilometer was important as it measured the rise of the floodwaters of the Nile. If the Nile did not rise enough, the land would experience famine conditions. If the Nile rose too high, it would flood and destroy the villages. In three periods the Nilometers were restored: pharaonic, Roman, Muhammad Ali. Every temple in Egypt had a Nilometer because it was a symbol of life. The only granite quarry in Egypt is in Aswan. The closer to the Nile River, the easier it was to float the stones downstream (to Karnak/Luxor and Memphis/Cairo). 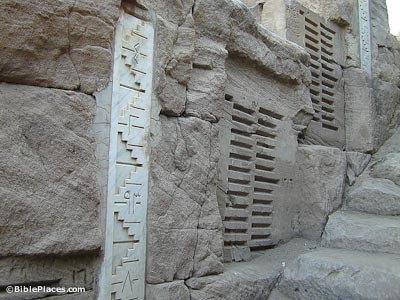 This is the largest obelisk discovered, but it was never finished for unknown reasons. Had it been completed, the weight of this obelisk is estimated to be at 1200 tons (the next largest obelisk weighs 300 tons). In order to transport the obelisks, four boats were strapped together, and three obelisks were laid crosswise. The Egyptians then waited for the flooding waters to carry the boats away. 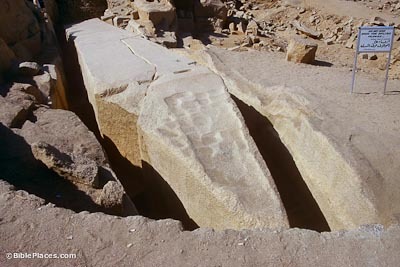 Hatshepsut recorded that work on one of her obelisks took 7 months. Elephantine Island was famous as a trading capital. Its name comes from the ivory trade with Nubia to the south. The island was also a frontier post for guarding the southern border of Egypt. Typically this island housed a strong fortress for the army. 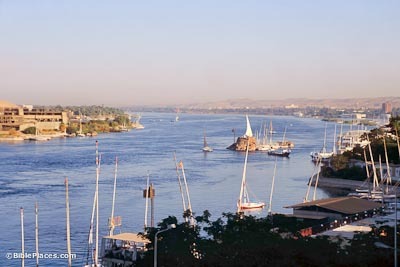 In antiquity, a bridge connected Elephantine Island with the east bank. Archaeologists have found continuous inhabitation of this island since the time of the Middle Kingdom. 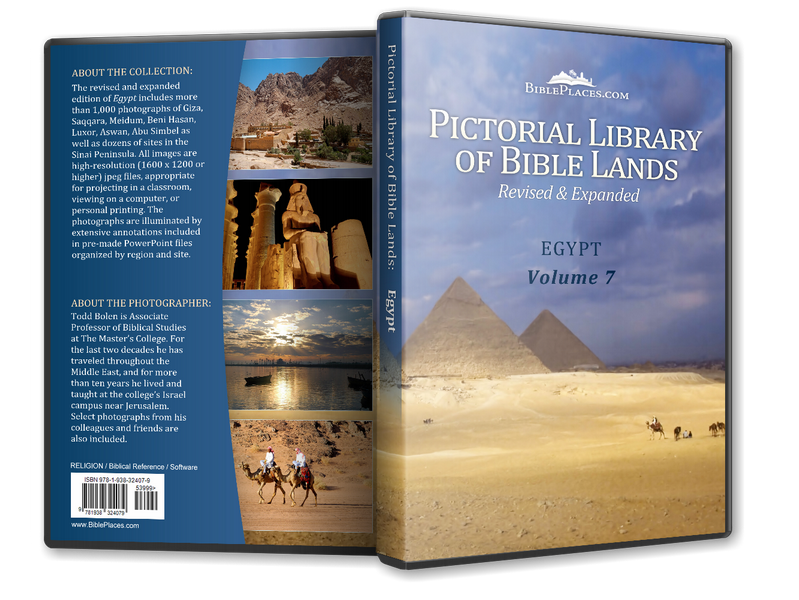 One collection of papyri discovered here is from a colony of Jews living on the island in the 5th century B.C. These documents include copies of letters sent to Jerusalem asking for help in the restoration of their temple. 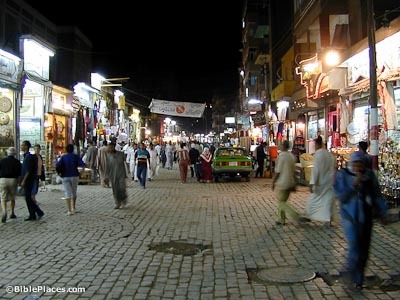 The city of Aswan today is small and relatively unimportant. Tourists are a major source of income. Another point of interest near the town is the High Dam. Completed in 1971 by President Nasser, the dam has stopped the annual inundation of the Nile River. The dam regulates the flow of water down the river to prevent flooding and it supplies Egypt with most of its electricity. In advance of the construction of the dam, many historical sites were relocated, including the temples of Abu Simbel. Near Aswan is Philae Island, recently “relocated” following the construction of the High Dam. Aswan, Egypt (lexicorient.com) Travel agent’s description of city with a couple of good photos. Aswan (University of Memphis) Brief description of four monuments near Aswan with photos. Aswan (Hermes Group) Travel Agency’s description of the major sites in the area. The Unfinished Obelisk (Tour Egypt) Brief description of monument and photo. Elephantine Island (Tour Egypt) General description of the island and its antiquities. Kitchener’s Island (Tour Egypt) Brief description and photograph of a Nilometer. The Tombs of the Nobles (Tour Egypt) Brief description and a couple photographs of the stone staircases.